Even though the America the Beautiful bullion series was approved by the Act of 2008, its first issuing appeared in 2010 and the America the Beautiful Washington Olympic 5oz silver coin 2011 is the eight bullion coin released to belong to this spectacular series. 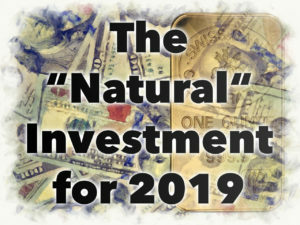 The America the Beautiful silver coins series will not end until 2021 so there is to be stated that some great years await collectors and investors and their decision of acquiring these coins must be made while they are still affordable. The America the Beautiful Washington Olympic 5oz silver coin 2011 was issued in the same year as the America the Beautiful Vicksburg National Military Park 5oz silver coin 2011, America the Beautiful Glacier National Park 5oz silver coin 2011, America the Beautiful Gettysburg National Military Park 5oz silver coin 2011 and America the Beautiful Chickasaw Oklahoma 5oz silver coin 2011. The America the Beautiful Washington Olympic 5oz silver coin 2011 weighs 155.50 grams of pure silver, has a diameter of three inches, and a purity of 999/1000 (99.90%). The obverse of the America the Beautiful Washington Olympic 5oz silver coin 2011 is the same as in the case of all coins from the America the Beautiful series. It depicts the bust of George Washington facing left together with inscriptions like UNITED STATES OF AMERICA in a semicircle at the top of the head side of the America the Beautiful Washington Olympic 5oz silver coin 2011, QUARTER DOLLAR at the bottom, and in the middle LIBERTY and IN GOD WE TRUST. 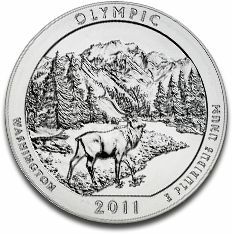 The reverse is representative for the name of this silver coin, illustrating Roosevelt elk near Hoh River and in the background is engraved the Mount Olympus. The legend on the tail side of the America the Beautiful Washington Olympic 5oz silver coin 2011 is OLYMPIC, WASHINGTON, 2011, and E PLURIBUS UNUM. The great thing and major advantage about modern bullion coins series that stretch over a long period of time, like the America the Beautiful series to which the America the Beautiful Washington Olympic 5oz silver coin 2011 belongs, is that the value of previous issued bullion coins increases as others are minted. 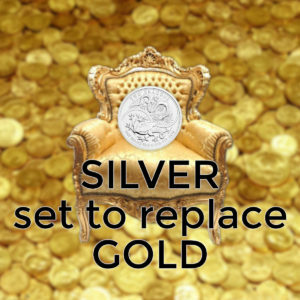 Therefore, when investing into a coin like the America the Beautiful Washington Olympic 5oz silver coin 2011 the investment must be made as soon as possible in order to be increasingly profitable in the future. 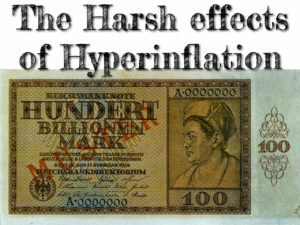 As years pass and the collection advances, more people are interested in owning the coins belonging to that particular collection, therefore increasing the premium for prior minted silver or gold coins. This is the major advantage of trading coins like the America the Beautiful Washington Olympic 5oz silver coin 2011, which is on top of other characteristics like the affordable price combined with the high purity and the considerable weight of pure silver. If collectors and investors become interested in owning the America the Beautiful Washington Olympic 5oz silver coin 2011 and maybe all the five silver bullion coins that were issued in 2011 by the American government, they can find them on our website. 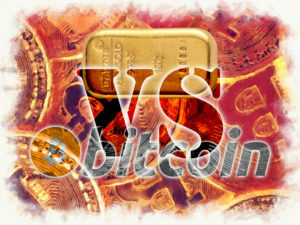 Gold vs. bitcoin: How do they compare as investments? 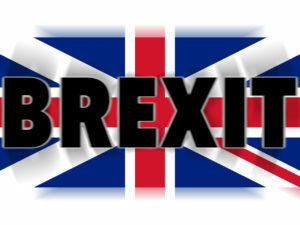 How will a no-deal Brexit impact investment and the economy?